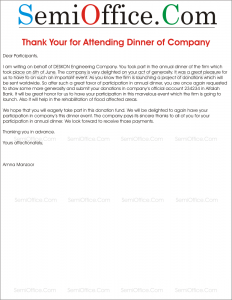 Letter from company manager to the participants of the annual dinner, thanking them and requesting them of a favor. Sample thank you letter to guests after the company dinner as followup. Our company is grateful for your presence at our annual dinner. This was an annual dinner in the honor all the employees and major suppliers. We specially thank the Chief guest and all other staff members/persons for attending our annual dinner. It’s an honor for us that you have participated in event that we have conducted on formal writing. It is noted that letter and formal communication in professional field is compulsory that’s why I feel this to conduct seminar. I thank you for your presence and your instructions and tips for formal writing. I thank you again. I am writing on behalf of DESKON Engineering Company. You took part in the annual dinner of the firm which took place on 6th of June. The company is very delighted on your act of generosity. It was a great pleasure for us to have to on such an important event. As you know the firm is launching a project of donations which will be sent worldwide. So after such a great favor of participation in annual dinner, you are once again requested to show some more generosity and submit your donations in company’s official account 234234 in Alfalah Bank. It will be great honor for us to have your participation in this marvelous event which the firm is going to launch. Also it will help in the rehabilitation of flood affected areas. We hope that you will eagerly take part in this donation fund. We will be delighted to again have your participation in company’s this dinner event. The company pays its sincere thanks to all of you for your participation in annual dinner. We look forward to receive those payments.